Kamala Harris made an announcement this weekend. Soon, she told MSNBC’s Mika Brzezinski, she’ll make a decision on whether she’s running for president. It’s not breaking news, but with the midterms behind us and the 2020 presidential election a short 23 months away, one of the top Democratic contenders setting a timeline for her decision is enough to generate dozens of headlines. 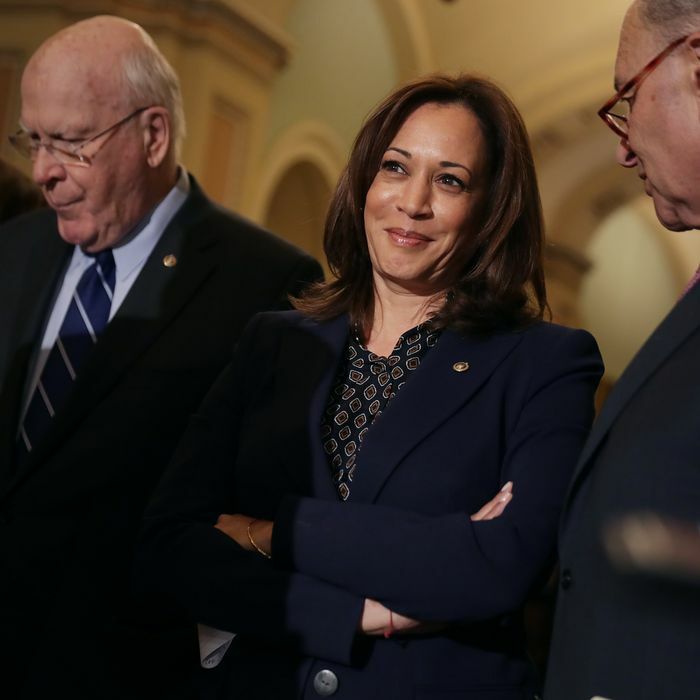 Assuming Harris sticks to that timeline, and assuming she and her family decide that she should run, and assuming she makes that announcement public shortly thereafter, she’ll be the first major candidate to announce her candidacy. The famously disheveled Brown was also sporting a fresh haircut. That could only mean one thing. Meanwhile, Honolulu Civil Beat caught up with Congresswoman Tulsi Gabbard a long way from home. She was in Exeter, New Hampshire to speak at a Rockingham County Democrat meet and greet, and when a reporter asked her about her 2020 plans she said she’s “seriously considering” a bid for president. If she does launch a long shot campaign, she appears to have already won over at least one New Hampshire voter. “She’s more important to me than Tom Brady,” Eric Jackman, who attended Gabbard’s talk rather than watch the Patriots game, told Honolulu Civil Beat. Not speaking in New Hampshire this weekend was Michael Avenatti, the attention-craving lawyer for Stormy Daniels who was recently disinvited from a prominent Democratic event in the state after a domestic violence arrest. As Politico reports, he’s also seen his TV bookings drop off and major Democrats speak out against his potential candidacy. Sounds like it’s time to add another name to the list of potential candidates.